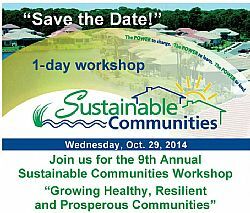 Sarasota County will hold its ninth annual Sustainable Communities Workshop Oct. 29, 8 a.m. - 4:30 p.m. at the Girl Scouts of Gulfcoast Florida Event and Conference Center, 4740 Cattlemen Road, Sarasota. Registration is open to the public, and advanced registration is encouraged. This year's theme for the popular, interactive workshop is "Growing Healthy, Resilient and Prosperous Communities." The Sustainable Communities workshop aims to cultivate innovative thinking and learning about better products, programs, and processes for improved health, local food, resiliency and prosperity. "Our 2014 workshop will provide information-rich sessions on a variety of approaches to grow a sustainable community," said Lee Hayes Byron, of Sarasota County Sustainability. "Expert speakers will provide up-to-date information on community strategies and resources, including concrete actions we all can take." Keynote Speaker Michael Shuman, nationally acclaimed economist and author, will discuss new opportunities for growing the local economy through strategies to localize spending on food and other goods and services. The cost of the workshop is $30 for professionals and the general public. Participants with student identification will receive a special rate of $20. The cost includes a continental breakfast, lunch and afternoon refreshments that reflect the principles of sustainable agriculture being discussed. Workshop sponsorship and exhibitor opportunities are available now. The county is partnering on this workshop with other community organizations, including the Greater Sarasota Chamber of Commerce Green Business Leadership Committee, Sarasota County's University of Florida/Institute of Food and Agricultural Sciences Extension, the Florida Department of Health in Sarasota County, the Sarasota Bay Estuary Program, the Charlotte Harbor National Estuary Program, Transition Sarasota and the Ringling College of Art and Design. To register to attend or obtain more information, including sponsorship and exhibitor opportunities, visit scgov.net/SustainableCommunities or contact the Sarasota County Contact Center at 941-861-5000.